Have you chosen the right gutters for your home? You have your gutters, and you’re staring at them with a wary eye. What happens next? Ideally, your preparation for gutter installation begins long before you and your gutters are having a standoff in your front yard. How can you prepare to install your gutters, and what resources do you need to do so in order to safeguard your home for many years to come? Roofing. What is the state of your roof? Do you need to repair this before adding gutters or do it along with your gutter installation? Gutter covers. Do you get a lot of debris in your gutters that damages them in the long term? If so, consider adding gutter covers the next time you install your gutters. These will help you reduce the amount of debris that can lead to sagging, damaged gutters. Gutter heat. Adding a gutter heating system to your gutters can save them during the winter months. Your gutters will no longer fill up with ice and snow and back up water onto your roof. Instead, water will flow freely into your downspouts. The fascia and soffit. The Family Handyman reminds us to “inspect the fascia and soffit for signs of rotted wood, which will need to be replaced before you put up the rain gutters.” Don’t put your new gutters onto a poor quality base. Downspouts. These are also part of your water removal system for your home. 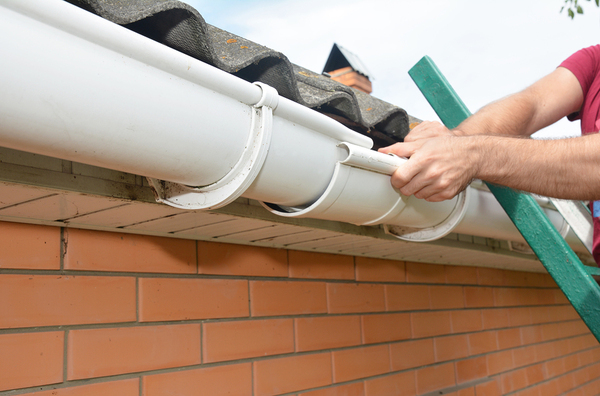 If they’re clogged or just not the right size, your entire gutter system could be compromised. Gutters can be stylish and complement your home, but choosing your gutter style is about much more than choosing your next gutter fashion. There are many different gutter materials, sizes, and styles. Gutters come in aluminum, steel, copper, vinyl, and zinc. Choose the most durable material that you can afford. This will help your gutters last for a long time without warping, sagging or rusting. Talk with your hardware store about the width of gutter that is right for your home. Different houses have different roof sizes and pitches, and this will impact how much water comes off of your home at one time. Consider what style of gutter complements your home. K-style gutters have flat bottoms and backs and often look like crown molding. Half-round gutters are half of a tube. They often suit old-style or historic homes. Think about what gauge of gutter you need. While the standard is 26 gauge, consider going for a higher gauge such as 32 in areas with a lot of snow, ice, and heavy rain. Should You Choose Seamless Gutters? If you’re looking at your gutter options and you haven’t invested in sectional gutters yet, consider whether your home would benefit from seamless gutters instead. Seamless gutters are custom-made for your home. They only have seams at the corners, rather than having seams in the middle of one side of your roof. With off-the-shelf sectional gutter products, you need to patch your gutters together to make sure that they are long enough for your roof line. Seamless gutter products are created and installed by professionals on site. Make sure that you have enough hangers and brackets for your gutters and downspouts. How can you install sectional gutters properly? Plan your installation before you start piecing your gutters together. Plan to minimize seams. Plan your downspouts. Locate them in areas where water can easily be directed away from the house, and avoid obstacles that you need to work around. Get the gutters and mounting equipment. Cut your gutters to size with tin snips. Cut notches when you need to connect gutter pieces. Cut a 2-inch notch to join gutters with an inside or outside corner piece and a 4-inch long notch to overlap and splice together gutter sections. Put the sections together. Try to do this on the ground if at all possible—it’s just easier. Place a bead of gutter sealant along the corner 1 1/2 inches from the edge, and hook the front of the corner over the notch. Snap the sections of gutter together. Rivet the sections together. Join them with six evenly-spaced rivets. Drill a hole and then install each rivet. Caulk the inside of the gutter with sealant, and put some on each rivet as well. When you get to the end of a gutter, extend it 1 inch past the end of the fascia board and then attach an end cap with rivets. Seal everything from the inside with gutter sealant. Where you need to have a downspout, mark the center of each downspout on the center of the gutter. Cut a V-shaped notch with a chisel and then use your tin snips to make the downspout hole. Cut 1/6th of an inch outside the line that you drew. Drill rivet holes into the downspout outlet. Place the outlet into the hole that you’ve made and put in the rivets. Screw the gutter to the fascia with 1 1/4 inch stainless steel hex head sheet metal screws. Make sure that you install one every 2 feet. Place gutter flashing under the shingles and secure it with nails. Install gutter hangers every two feet. 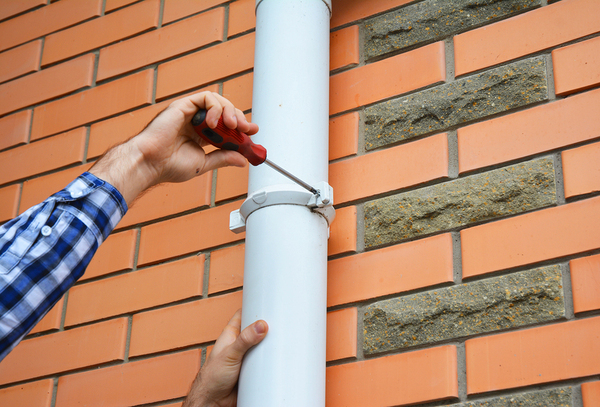 Add your downspouts: first, install the downspout elbow, add brackets for your downspout and secure them to the wall, and then install your downspouts. Rotten roofing, fascia, soffit boards, and more. Make sure that all of the objects that connect to your gutter system or support your gutters are working well. The angle of your gutters. This can be a problem that leads water to move more slowly and may cause debris to accumulate in your gutters. Make sure that your gutters are large enough, especially if you live in an area with heavy rains and you have a steep roof. Ensure that your gutters have enough support. Get adequate hangers for your gutters. When in doubt, connect with a professional. Your gutters are too important to install incorrectly, and doing so can damage your home. A consultation or the assistance of a professional can help you determine whether your gutters will do a good job moving water away from your home or whether they will start to warp because the angle is incorrect and they’re filling up with debris. At Harry Helmet, we’re committed to seeing your home become a safe and well-maintained place for you and your family to grow. If you’re looking for gutter covers, gutter, or roofing, talk to us. We’ll help you make your gutter and gutter cover choices and install the gutters that are right for your home. Schedule an appointment today.